What a day! We heard amazing sermon this morning on why we need to remember. My uncle was in the south tower...profoundly affected our family. He made it out, but man, the delay in finding out was horrible. 9/11 changed the whole world. I am from Jamaica and some 16 Jamaicans were killed. 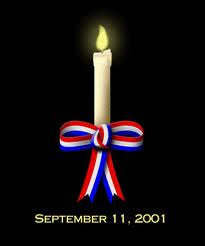 My prayers and thoughts go out to all the relatives and friends of the almost 3, 000 persons who died. I am a new Follower of your Blog. Happy Birthday to The Kid Born in The Bathroom! Wordless Wednesday- My New Favorite Tee! Our First Day of Public School! Nutrisystem- Just One of Those Weeks!